Fact: cheese boards are a crowd-pleaser. Whip one out at drinks with the crew and you can bet that within the hour, your beautifully arranged platter will be nothing but grape stem debris, water cracker crumbs, a smear of remnant quince and maybe even some mangy olive pips. The humble cheese board lays the foundation for any good gathering, so we’ve teamed up with the fresh produce experts at Lamanna & Sons to help take our platter game from novice to pro. It’s easy to get carried away once you’re in the deli isle (otherwise known as heaven), but we’re here to make things easy for you. Depending on how many people you’re catering for (or how much you love cheese), two-to-three varieties should do the trick. The key is to serve up different textures and flavours. There are hard aged cheeses such as cheddar and Gouda, soft cheeses like camembert and brie, and of course the divisive blue cheese. After all, eating a balanced diet of cheeses is important, right? It’s easy to fall back on the reliable water cracker, but we’re here to tell you that variety is the spice of life. Cheese and cracker pairing is a fine art and you shouldn’t be throwing down any stale ol’ cracker you find in the depths of your pantry. Opt for something plain and simple for your stronger cheeses and something a little more flavoursome to pair with subtle cheeses. Also, if you’re looking to really impress, add some grissini or fresh baguette for serious carb deliciousness. Once you’ve got the main stars of the show on the board, cover up every last inch with fresh fruit. Sweet and savoury combos are what dreams are made of, so make sure to include a few types with different textures. We’re big fans of strawberries, red grapes and sliced apple as they will make the platter pop with colour. And whatever you do, don’t forget the quince! Now that you’ve got the major food groups sorted, it’s time to turn the cheese board into a smorgasbord. To complete the all star lineup, you’ll need to add meats, dips and other mouth-watering deli goodness. It’s easy to go overboard when it comes to the final touches, so to stop yourself from splashing too much cash, try and stick to a couple of extras. Our fave additions to a cheese board include olive tapenade, pate, gourmet dips (think beetroot and almond) and cold meats like rolled up prosciutto, mortadella and salami. Drool. Sadly, sometimes there just ain’t enough time in the day to be navigating six isles of the grocery store or to be perfecting the perfect quenelle quince paste, so it’s good to know that the guys at Lamanna & Sons have recently just released there brand new grazing platter packs. So whether you’ve been conned into last minute entertaining, you’re time-poor or would just rather have the hard work done for you (guilty), these beaut packs will have you well and truly sorted. 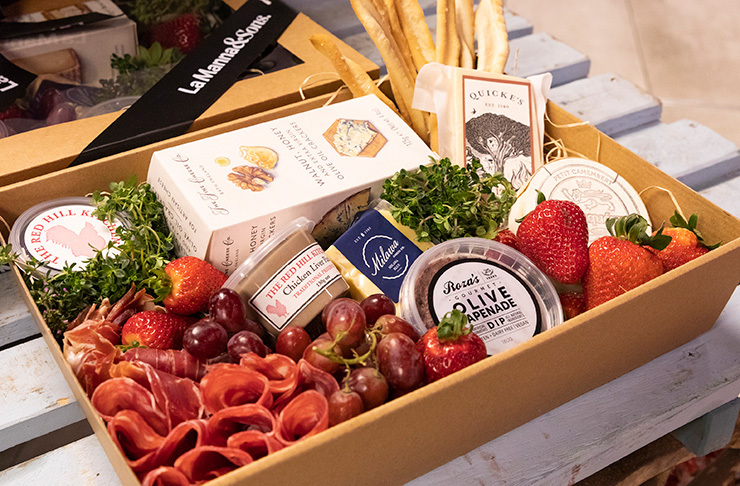 Coming in both a six and twelve-person serving size, the hampers are packed with premium goodies, ready for you to plate up and eat at home. All listed products are available at Lamanna & Sons (670 Chapel Street, South Yarra). Editor’s note: This article is sponsored by Lamanna & Sons and proudly endorsed by The Urban List. Thank you for supporting the sponsors who make The Urban List possible. Click here for more information on our editorial policy.